Life Fitness 95Te treadmill takes all the quality advances of the best selling treadmill, the 95Ti and adds superior upgraded electronics. The Life Fitness 95Te treadmills basic features are exactly the same as the 95Ti’s, but the Life Fitness 95Te comes with one of the most advanced LCD Displays available anywhere. In addition, you have access to more than 125 TV channels which are FM-ready. 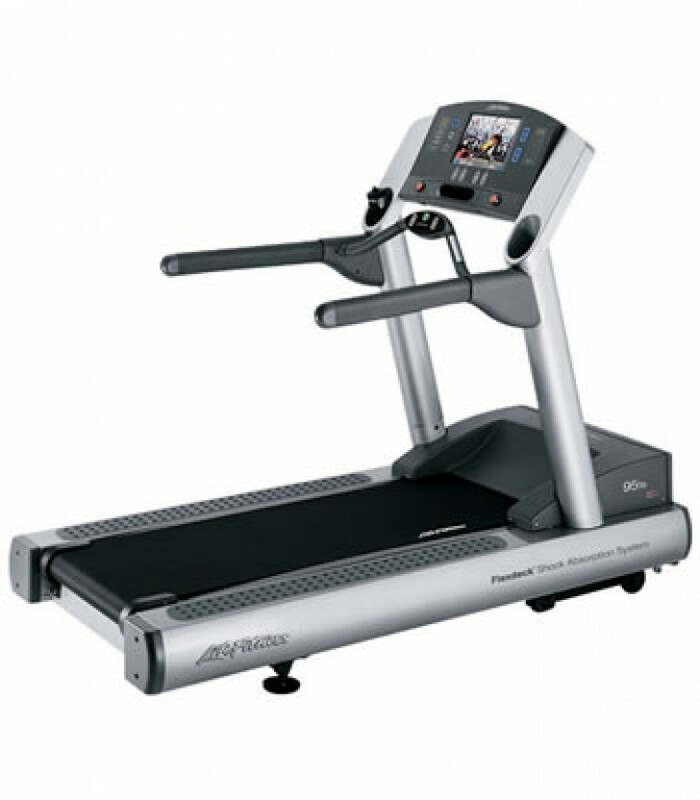 The E-3 Integrated LCD System introduces touch-screen technology to the treadmill for simple workout fine-tuning. Powered by an Intel microprocessor, you will find a GUI (graphical user interface) along with an integrated help menu. Other notable accessories include a reading rack, a tray to hold hydration supplies, and a placeholder for personal electronic equipment like an MP3 player. Digital Heart Rate Monitoring is enhanced by Digital Signal Processing (DSP) for a more precise heart-rate read-out. Just like on the 95Ti, you’ll feel secure with ergonomically correct handle-bars and non-slip side rails. All in all, the Life Fitness 95Te treadmill takes the exciting looks of the 95Ti and adds a beautiful LCD console. Graphical user interface with touch screen.